Edith King was born in Pietermaritzburg in 1871, but grew up and was educated in England when her mother returned there following a failed marriage. Mary King worked while her children were cared for and home schooled in their early years. In 1894 Edith graduated from Bedford College, University of London, in modern languages. Her first employment was as a governess before taking positions as a deputy and senior mistress at English schools in the 1890s. In 1903 she attended life drawing classes at the Bristol Municipal Art School. In 1904 she traveled with her mother to Nottingham Road in the KwaZulu-Natal midlands for the birth of her sister's daughter, Ruth. In 1905 she qualified for an Ablett Teachers Certificate from the Royal Drawing Society and took up a position as an art teacher at Eunice School in Bloemfontein. Between 1907 and 1911 she worked with her sister in Mpumalanga. In 1911 she publisher 'Veld Rhymes for Children'. 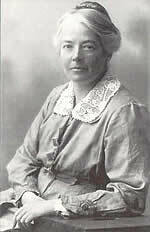 In 1912 she was appointed Headmistress of Eunice School where she remained until her retirement in 1923. Edith then joined her sister and niece in England and Europe until 1929 when they returned to South Africa. Edith then lived in a cottage on her sister Bertha's farm 'Bonnefoi' until her death, although she traveled extensively through out the country in the 1940s and 50s. Edith worked exclusively using watercolours to depict landscapes and still life subjects. She was fascinated with nature and her botanical depictions often dominate the foreground of her paintings creating a strong decorative element to her compositions. Edith would frequently paint many studio versions of a veld sketch before she was satisfied with the composition of her work. Her naïve style of painting with its strong sense of rhythm often belies her sophisticated composition. Edith organized exhibitions for her sister, Bertha and Bertha's daughters, Ruth Everard Haden and Rosamund Everard-Steenkamp and cajoled them to provide work. Edith and Ruth would often paint together when on holiday. Edith participated in numerous group exhibitions through the 1930s, 40s and 50s including the Everard Group exhibitions of 1931 and 1935. In addition, she participated, as did her sister, in the numerous historical exhibitions of the time such as the van Riebeeck Tercentenary in 1952 and the Pretoria Centenary Historical Exhibition of South African painting in 1955. The 1982 Everard Group retrospective held at the Tatham Art Gallery and the 2000 exhibition entitled 'The Everard Phenomenon' which toured South Africa focused attention on this often overlooked lineage of South African women artists.